You take my finger. You start walking. I wonder where you’ll lead me. This is one of my favorite things about you right now. I find your shoes everywhere. Once Dadda and I were getting you ready to go out with us, and we found one of your shoes in one of the kitchen cabinets. At a different time I found one of your books in another cabinet. You love the kitchen cabinets. We’ve childproofed most of them, but we left two of them free for you to play in. I put old plastic cups and old tupperware containers in them, and you have fun taking them out to examine and leave all over the kitchen floor. I sometimes don’t clean up after you right away so I can come into the kitchen later to find evidence of your play. I love how much you play. You no longer lie still with a bottle. Unless you’re extremely tired. With a bottle in your mouth, you walk around different parts of the apartment, as if you’re inspecting the place. 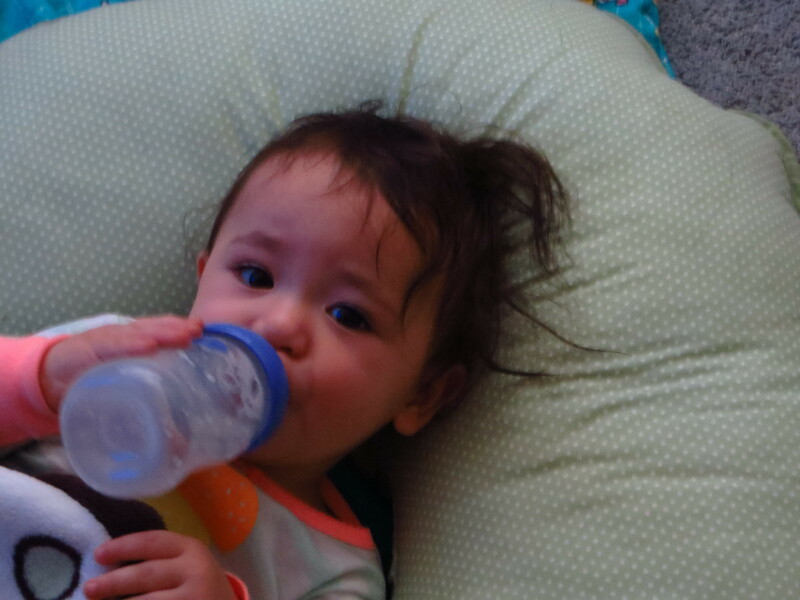 Then the level of your food gets to where you need to tilt your head way back or lie down to finish your bottle. And you often finish your bottle, because your increased play works up a big appetite. You often fight naps because playing is so much better. The whole apartment has evolved into your room. You used to keep the books in your room separate from your books in the living room. You used to keep your toys in separate rooms as well. And you sometimes even bring books from Mama and Dadda’s room to different places in the apartment. Everything’s a surprise with you. This can be both good and bad. Just the other day I imagined giving you crayons and paper to start coloring. And then I imagined crayon all over the walls. And then I realize that while I enjoy playing and laughing with you, there are so many opportunities to teach you. But I think we can make learning fun. I will try to keep you surprised as well. You are officially a toddler. Because you toddle. And I love it. The weather has been a lot warmer than normal for this time of year, and for the past few days we’ve let you wander outside. The ground is uneven and you stumbled a bit, but you adapted quickly. You go just about anywhere now. Your world has expanded. You sing, you dance. You smile so easily. You give kisses so generously. But you also get angry when you don’t get what you want. I will excuse that for now because you’re a baby, but be prepared to understand that you will not always get what you want. Even if what you want is good. You may end up having to wait for it or realize that you may not get it at all. But you can still be happy, anyway. Life is interesting like that. You are growing so fast, and you are discovering so much. I love how you see the world: always somewhere to go, something to touch and explore and study. You are so, so, happy, and that makes me and Dadda happy. Thank you for leading us to so much joy. That’s my grand daughter! !She is very much love.